Reminder: Monday will be a professional development day for staff and a NO SCHOOL DAY for students. This is a change to the original school year calendar. Read more. Science mixed with snow makes for one fun lesson for students at Stillwater Middle School. Seventh graders experimented with science concepts (like friction, force, velocity and mass) by engineering sleds using only cardboard, plastic, and duct tape. They put their designs to the test and earned points for how far their sleds traveled as well as for artistic creativity. See more photos on our Facebook page. In science classrooms at Oak-Land and Stillwater middle schools students are transforming piles of Legos into functioning robots. But what may look and feel like play is actually a lesson in deep learning for the sixth grade students. Read more. About 40 freshmen are participating in the AP with We Service program, which includes 20 hours of meaningful hunger-related community service. Students will earn service hours by volunteering with organizations such as Valley Outreach, Our Community Kitchen, Fare For All, PowerUp, Feed My Starving Children, Second Harvest Heartland, Meals From The Heart, North Hill Community Garden, Pollinator Friendly Alliance and the RCS Giving Garden. Read more. 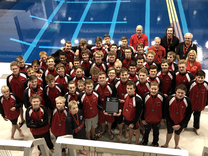 Congrats to the boys swimming and diving team for placing second at the True Team state meet! True Team competition is based on the idea that every team member's performance counts toward the team's score in competition. It's the Ponies fourth runner-up finish in the last five years. Don't miss your chance to tell us what students need! As parents, you have a vested interest in helping ensure your children's success beyond high school. Which is why we are asking for your help in defining the Portrait of a Graduate, an important document that will be the foundation of the district’s next strategic plan. Learn more. Share your thoughts on what students need for success. Take this short survey now! Did You Know? It's estimated that in 2018 only 33% of jobs will require a four-year degree, while 57% will require some type of specialized training. Check out these videos for even more staggering statistics about the impact of the changing economy on our community and our local schools. The school board will hold a work session for the purpose of board development from 1 ‐3 p.m. on Friday, February 2 at Central Services. The school board will hold a closed session at 5 p.m. on Thursday, February 8 at Stillwater City Hall, to discuss property identified as Parcel ID 36.029.21.43.0001. Pursuant to Minnesota Statute §13D.05 Subd.(3). to develop or consider offers or counteroffers for the purchase or sale of real or personal property. Read the official notices online.